(June 28, 2013) -- The Oklahoma State colors are black and orange, UTSA's are blue, orange and white -- and the fans of both teams tend to wear orange. In anticipation of a large, orange-clad Cowboys contingent at the Sept. 7 football home opener at the Alamodome, Roadrunners fans are asked to wear white. 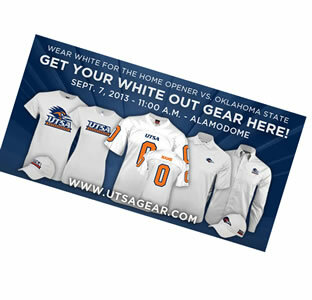 UTSA Athletics online merchandise provider, UTSAGear.com, has a wide array of white apparel in men's, women's and children's sizes including t-shirts and hats for UTSA fans. The football team will follow the lead of its fans and will wear all white against its first-ever Big 12 opponent. Kickoff for the nationally televised game on FOX Sports 1 will be at 11 a.m.
A bonus to the contest will be a pregame and halftime celebration of the Alamodome’s 20th anniversary season. Local leaders who headed the push to build the facility will be honored in pregame ceremonies. Significant Alamodome events over the last two decades will be highlighted in video and music played by the UTSA band at halftime.